A brand new exclusive Jen Clothing design — you’ll fall in love with the Jenna lace dress! The a-line silhouette features a fitted top with round neckline, short sleeves and a gathered elastic waistline. It’s ideal for any special occasion or event, but it’s also styled simply enough to work well for date night or going to church. It would also make a wonderful modest bridesmaid dress! Available in 7 stunning colors, you’ll love the Jenna lace dress for all occasions! Available in Navy Blue, Royal Purple, Grey, Burgundy, Lilac, White & Mint. *The Royal Purple & Lilac colors coordinate & would make for a stunning bridal party!! Care: Machine Wash Separately, Delicate Cycle, Cold; Hang Dry *The tag says “hand wash” but machine washing separately on delicate cycle works fine. Total Length: XS-39″ S-40″ M-41″ L-42″ XL-43″ XXL-44″ *This is the length of the dress including the lace. Please note that the lining is a bit shorter than the lace. 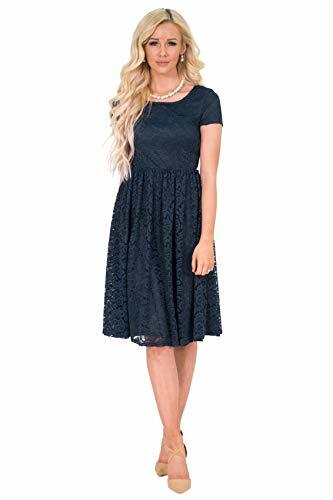 Modest Knee-Length Full Lace Dress with Short Sleeves; Pullover style, no zipper. 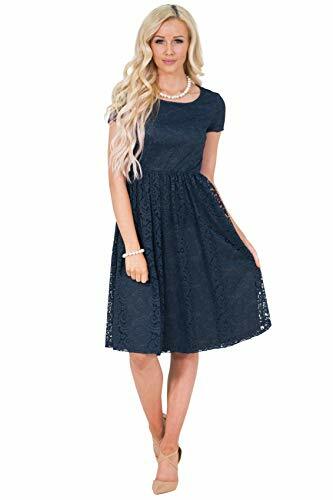 Modest Semi-Formal Dress – Perfect for Homecoming or Prom, Holiday Parties or as a Modest Bridesmaid Dress! Very figure flattering while still being modest! Beautiful & comfortable at the same time! **How do I find my size? 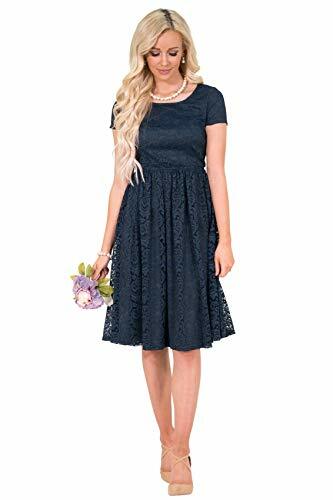 Use the Amazon Women’s Apparel Size Chart for this dress!